I’m sharing how to clean laminate floors like a boss today by shedding light on my secret weapon that’s been giving me sparkling, spring-fresh floors and all the feels. The best part? It has handled all the hard surface floors in my home like a champ, in a jiffy, with its quick drying, residue-free solution. If you’re like me, you want to spring clean as quickly as possible with all the cleaning hacks. I can’t wait to share this new favorite with you. What is it? Keep reading, friend! This post is sponsored by Bona but as always, the content and my southern opinion expressed are my own. Even though I’ve been in spring cleaning tips mode, I’ve been worried about taking care of our beloved living room laminate that Superman so meticulously installed right by himself. Then there’s the luxury vinyl in the kitchen has been looking old and dull for a while now. 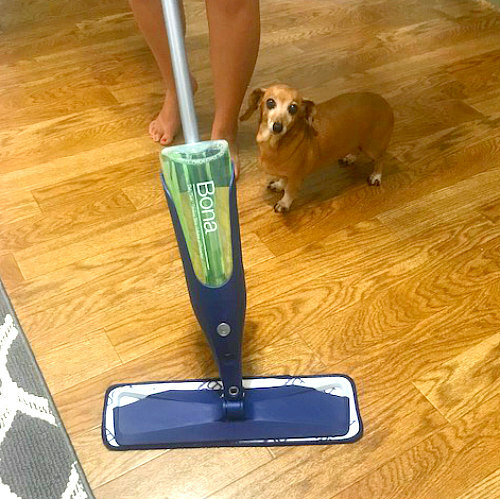 My kitchen floors look so shiny and the newer living room laminate is beautiful because….. my premium spray mop & cleaner is specially designed to remove dust, dirt, and grime – but without residue or slickness. It also carries the GREENGUARD GOLD certification so I can feel safe using it around the family and pets. I’ve been dying to tell you all about it because I’m definitely in love! WooHoo! clear the floors of any clutter and small decorations. quickly sweep up any loose dirt, dog hair, or dust bunnies. Throw your dirty cleaning pad in the washing machine when you are done. Here are my favorite attributes of my new b.f.f. mop. Is it strange that I’m thinking of giving him a name?! I know I could stand to give my hard surface floors more love on a weekly basis and now I don’t mind at all. I’m just glad that I finally know how to do that quickly and easily, and caring for our floors with Bona shows how much we love them! What is the best way to clean laminate flooring? We all know that an excess of water and liquids are not good for laminate or any other wood flooring. Making sure that laminate floors are cleaned with the right amount of water is crucial. Again, Bona to the rescue. The mop sprays out the smallest amount at a time to leave a streak-free clean floor without damage. How do you clean laminate floors without damaging them? As mentioned in the last answer, the worst thing you can do to clean a laminate floor is to use a wet mop or hot steam mop. 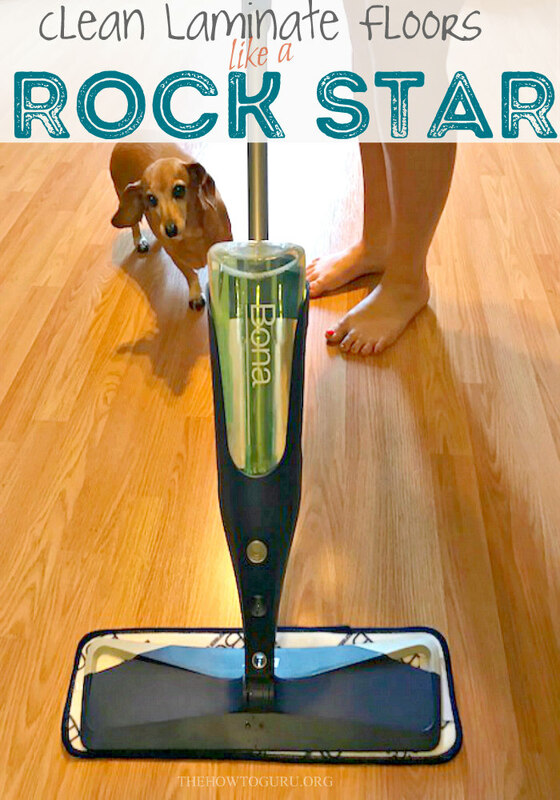 Carefully using the bona mop will help you gage the liquid added to the floor and quickly remove it so that no damage occurs. Now that you know how to clean laminate floors with this easy system, are you ready to get started?! Let me know in the comments! I’m checking this out! I hate mopping and my floors never look great so I put it off wayyyyy to long. I will have to check this out. I loved our steam mop, but it is definitely on its last leg. Sorry about your mop, Emily! I’m really loving this one. I love Bona! 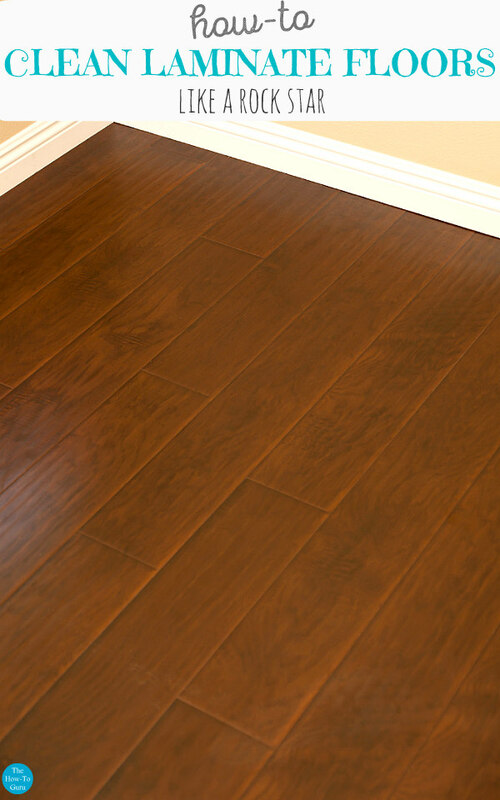 I have been using it for years on my hardwood floors and it works wonders. That’s awesome, Ayanna! Thanks for the great review. You’re on the ball! Sounds good! I hate the residue/water streaks that remain behind like unwelcome guests. I have this same mop and I’m not sure what I would do without it. It is so convenient to clean up quick spills and sticky floors. 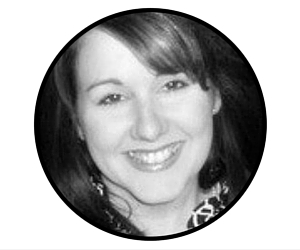 Thanks so much, Jen for adding in your experience! I’m so excited to have it! Yay, Johanne. I hope you love it as much as I do! Let me know what you think! Wow, I love learning about new cleaning products. There is nothing worse than trying a new product only for it to fall short. Your review was so helpful! You are right, Lee. Let me know what you think about it! I like using Bona for sure! I have laminate floors, but have not used Bona before. I will have to give it a try. Yay, Jennifer. Let me know what you think! I need something to freshen up my floors! My mop looks like yours, but it is just not doing a great job. I’ll have to look into the Bona. This is great advice . We have carpet in our house that needs to be changed out badly. We are considering laminate floors as an alternative so this will be very helpful once we make the change! That’s exciting, Sandy! Congrats on the new floors soon. We have three rooms to do the same and I can’t wait! This post is such a lifesaver! This sounds great! I LOVE Bona to clean my floors! It’s seriously the best! I need to get one of these! Our kitchen floor gets the worst of it and is in terrible need of some love! Seems like a great solution for my floors. I use a similar mop from Target but the squirter is always sticking. Might be time for an upgrade! Beautiful floors! I love anything that makes the stickiness go away! Man, these are great tips to remember! I actually used to work at a flooring store when I was in college and Bona mops are what we recommended to clean wood and laminate. I still use one to this day! Great tips! I LOVE my Bona, too. This looks like a great product especially for wood floors. I’ll have to try it. I’ll be looking into this! I had a steam mop (which I loved), but it went kaput. I’m in the market for another tool! We’re getting laminate flooring and I am super excited to get this mop system! If my lighting were a little better (it’s 11 pm), I’d take a picture of my beautiful laminate floors that I just cleaned with my Bona mop. I am WAY too excited about this thing! My floors are gorgeous! We don’t have laminate flooring but my mother in law does and she will LOVE this! Thank you for sharing! I’m going to try your recommendations.